SRG manufactures honeycomb waveguide which offers protection up to 40GHz. This product is offered in steel, brass and stainless steel. 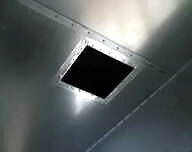 It is supplied with a 50/50 (lead/tin) coating or lead free, “Euro-Vent”, which is 95/5 (tin/antimony) coated. The material can be supplied in stock sized sheets or assembled into mounting frames. SRG is a leading supplier of this material to shielding companies world wide. SRG's manufacturing process includes applying a thin coating of 100% tin to the raw base strip base material. The thickness of the coating is extremely critical and must be within .0015"-.002". After the base strip material is formed, cut to the desired length and assembled as a sheet, it is placed in an oven. Under a controlled set of parameters the temperature is raised until the tin coating is allowed to flow via capillary action, a process we have named fusion bonding. Once cooled, the sheet becomes a bonded or fused honeycomb matrix offering structural and RF intergrity. To ensure each manufactured sheet maintains the required performance level in terms of shielding effectiveness, we implement a stringent quality program that couples 100% visual inspection along with shielding effectiveness testing done by a NVLAP-approved independent agency. 1/8" x 1/4" 3/16" x 1/4" 1/4" x 1/2"
1/8" x 1/2" 3/16" x 1/2" 1/4" x 1"
1/8" x 5/8" 3/16" x 5/8" 1/8" x 3/4"
3/16" x 3/4" 1/8" x 1" 3/16" x 1"
For mounted frames, please specify if mounting holes or RF gasket is desired.